For the history of the Federation, see History of Yemen. Map showing both the Federation of South Arabia and the Protectorate of South Arabia. 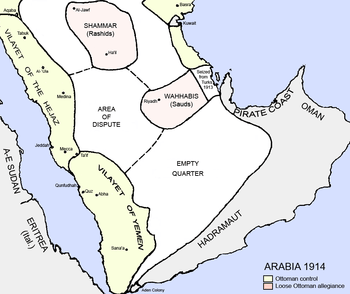 The Federation of South Arabia (Arabic: اتحاد الجنوب العربي‎‎ Ittiḥād al-Janūb al-‘Arabī) was an organization of states under British protection in what would become South Yemen. It was formed on 4 April 1962 from the 15 protected states of the Federation of Arab Emirates of the South. On 18 January 1963 it was merged with the Crown colony of Aden. In June 1964, the Upper Aulaqi Sultanate was added for a total of 17 states. A team was sent to the 1966 Commonwealth Games in Kingston, Jamaica. The Federation was abolished when it gained independence along with the Protectorate of South Arabia as the People's Republic of South Yemen on 30 November 1967. The Federation issued its own Adeni postage stamps from 1963 to 1966. Most of its issues were part of the omnibus issues common to all the Commonwealth territories, but it did issue its own definitive stamps on 1 April 1965. The set of 14 included 10 values, from 5 to 75 fils, each depicting the arms of the Federation in a single colour, while the top four values (100 fils, 250 fils, 500 fils, and 1 dinar), featured the flag of the Federation. The stamps referred to above are those listed in the Scott Standard Postage Stamp Catalog. A number of other stamps have also been issued and are listed in Stanley Gibbons and other widely used stamp catalogues. It is possible, or even likely, that some of the stamps of South Arabia were not issued primarily for postal use. 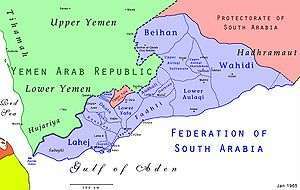 ↑ After Aden joined the federation, the federation was occasionally referred to as the "Colony of Aden". Wikimedia Commons has media related to Federation of South Arabia.